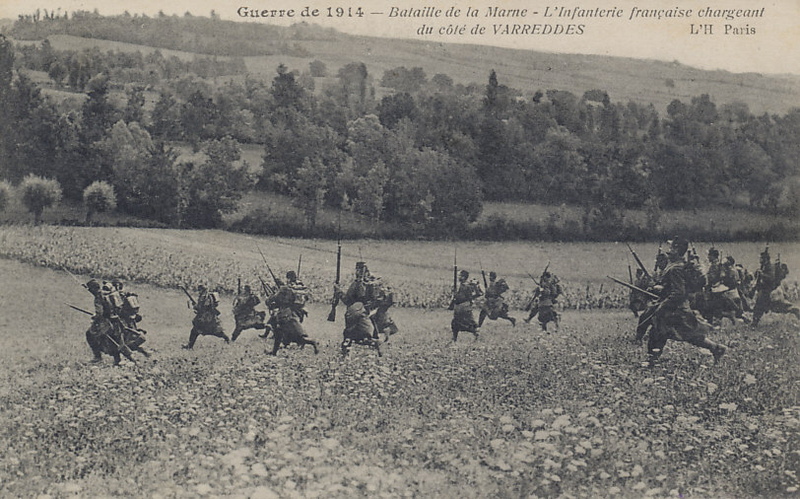 The Battle of the Marne, September 1914. The infantry are very likely from the French Sixth Army advancing against the German First Army near Varreddes northeast of Paris. The Sixth Army attacked on September 5, the day before French Commander Joffre's counterattack from the Marne River that ended, and in part reversed, the lengthy Allied retreat. 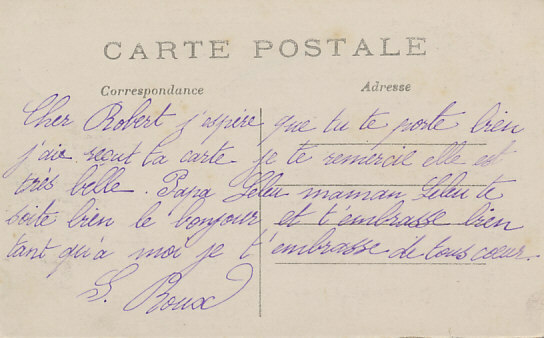 Cher Robert j'espere que tu te porte bien j'ai récue ta carte je te remercie elle est tres belle. Papa Geleu(?) maman Geleu te boite bien le bonjour et t'embrasse bien tant qu'a moi je t'embrasse de tous coeur. Dear Robert I hope you are bearing up well I received your card thank you it is very beautiful. Papa Geleu (?) Mom Geleu send you good morning and kiss you as well as for me I embrace you with all my heart. On September 5, 1914, the German First Army under General von Kluck was northeast of Paris, pursuing the French Fifth Army newly commanded by General Franchet d'Esperey. Von Kluck was a day's march ahead of the German Second Army on his left, and thought the Allied forces on his right wing insignificant. Retreating before Germany's invasion of France, French Commander Joffre asked his generals when they would be ready to strike. Franchet d'Esperey would be ready on September 6. On the 5th the new French Sixth Army attacked from Paris, striking the right flank of the German First Army passing to the northeast. Other Allied forces were retreating, preparing for the next day. The German First Army turned from pursuing the retreating Allies, to defend against the attack from Paris, forming a line facing west, exposing its back, and widening the gap with the Second Army. When the Allies counterattacked on September 6, the British advanced into the gap, as did the French Fifth Army's left wing, even as its right engaged. 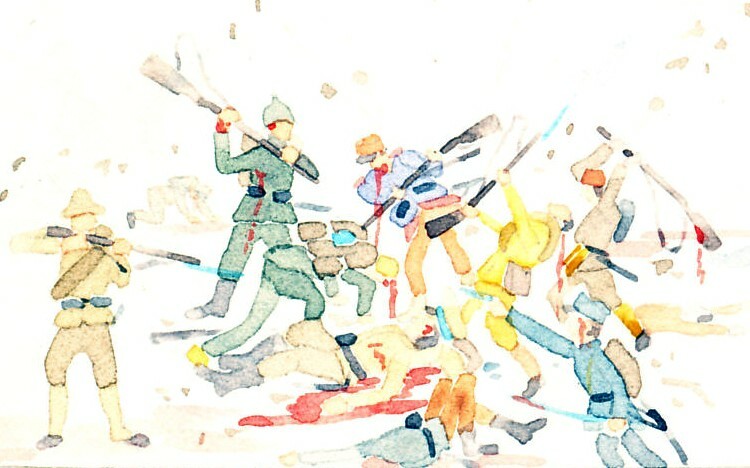 On September 6 and 7, the French Fifth and Ninth Armies fought the German Second and Third Armies, with the French Ninth being driven back and the German Second retreating behind the Petit Morin River. On the night of September 8, Franchet d'Esperey attacked across the river. Von Bülow pulled back his right wing, increasing the gap with von Kluck. Out of contact with his generals, German Commander von Moltke dispatched Major Richard Hentsch to get an understanding of the situation, giving Hentsch some authority to act in his name. Visiting the Second Army after the successful French attack of September 8, Hentsch agreed with von Bülow's decision to retreat. Finding the First Army isolated, Hentsch ordered it to retreat in conjunction with von Bülow. On September 11, von Moltke ordered a general retreat.